Mabel Constance Clifford was born on 24 September 1874 in Frampton to Henry James Clifford and Annie Francis Hilton-Green. During her childhood, the family had had an extended stay in Lausanne, Switzerland, where she had learnt to speak French. Home, at the outbreak of war, was The Grange, Frampton, amongst several members of her family. Very shortly after war was declared, Mabel and her older sister, Edith Katherine, joined the French Red Cross where she was able to make good use of her language skills. She was posted to Longueil-Annel on the Western Front, probably alongside Edith (see the Gallery photograph of WW1 nurses with an ambulance). 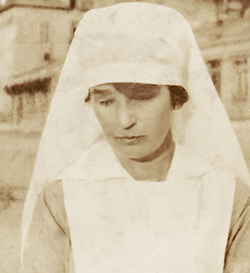 On 16th October 1917, Mabel was awarded the Croix de Guerre, and members of her family believe that this was in recognition of her heroism during the evacuation of the hospital she worked in as the Germans swept through. After the war, Mabel also received the Victory Medal. Miss Mabel, as she was affectionately known to us all, died suddenly at her home Garden End on The Green. She was a great and true friend of everyone, always ready with a cheering word and smile for anyone she met. Her life was long, and all through she took a full part in village life. Quietly, seeking no praise, she worked faithfully until the end. She was indeed a great friend and the basis of that friendship was securely founded upon her faith and love of God, and God’s House. All her life she put God first and was a devout worshipper with us. She was a wonderful and patient gardener and many of us know how she worked long hours in the garden she loved. Quietly, serenely, hopefully she worked and in God's garden she worked in the same way. The memory we have of her is a priceless one.